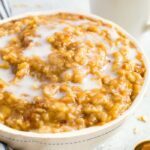 This warm and gooey salted caramel oatmeal is swirled with an easy date caramel sauce giving it that perfect blend of sweet and salty. Vegan + gluten-free. Place oats, water, banana slices and salt into a saucepan and bring to a boil, reduce heat to a simmer and cook stirring frequently until the oatmeal is cooked and creamy, about 5-7 minutes. Portion oatmeal into a bowl, drizzle date caramel sauce on top of oats and stir. Add a little almond milk on top, if using. To lower the sugar content: skip the banana or use less date caramel sauce. To up the protein content: stir in 1/2 -1 scoop of vanilla protein powder after cooking.